Monday is your lucky day at Northern Lights Casino. 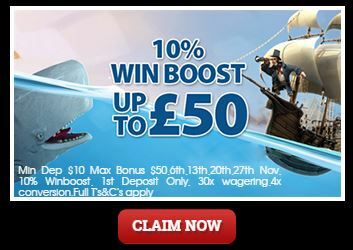 Make a deposit of minimum 10 Pounds every Monday this November and you can get a 10% match bonus up to 50 Pounds. In order to qualify for this promotion, you need to have a minimum profit of £10 in the promotional period. The maximum reward you can get is 50 Pounds and they will be credited as bonus funds. They can only be used in slot machines and cannot be withdrawn. It can take up to three working days to get to your account once the promotion ends. Claim it now before it's too late and start having lots of fun!